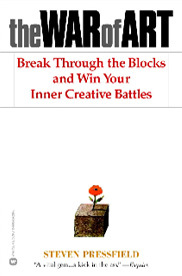 I recently read The War of Art, a book by Steven Pressfield. He wrote about his early years while aspiring to become an author. He had been struggling mightily to complete his manuscript that he hoped would finally make his dream of becoming a published author a reality. He had previously written manuscripts that were 90-95% finished, one that he spent nearly every day for two years working on, only to throw them into the trash before they were finished. He did so because he thought they were not good enough and did not want the publishers to disregard his future work. He met another writer who had several published books that would become his mentor. One of the key points he learned was that he had to make himself sit down most every day and write, regardless of how he felt or if he was suffering from writers block, he needed to sit down and produce something. He also learned that he needed to write for himself, not what he thought somebody else would want to read. Lastly, he had to learn how to finish his work and submit it to the publisher. The help you'll give her is not about softball. It’s about all the other dreams she’ll have the rest of her life. And so he finally completed his manuscript by writing the words The End for the first time and submitted it to the publisher. He was so happy he went to see his mentor to tell him the news. His mentor only said, “That’s great. Start writing your next one right now.” His excitement quickly faded, but he knew his mentor was right. He needed to keep the momentum going and get to work. He went on to the become a best-selling author of many books including The Legend of Bagger Vance, which was made into a movie directed by Robert Redford and starring Will Smith, Matt Damon, Charlize Theron and Bruce McGill. If softball is truly her dream, then it is up to you, the parents, to help her overcome this resistance to chase her dreams. Start by remembering this: Your help is not about softball. It’s about all the other dreams she’ll have the rest of her life. Softball is just an opportunity, a teachable moment. It should only be because she loves the game and wants to play (period). Think of ways to get her to think about, practice or play softball as often as possible without nagging her. Offer to pitch her some wiffle balls, take her to the cages to hit or play catch, watch softball videos on youtube, watch softball DVDs, read softball articles, quotes from coaches, etc. Keep it light, positive, funny or in a manner you know your daughter will relate to. It has to be fun and it cannot make her feel you’re making her do it. If you take her to lessons, pay attention so that you can help her if she gets stuck or struggles with something. I have found that the older your daughter gets, the harder it is to help her in this way. It’s the norm, so don’t panic. One thing for sure: You can’t want it for her. If this becomes apparent, it’s probably not her dream anymore if it ever was in the first place. From the book I referenced, this would equate to the author sitting down and writing every day, regardless of if he was drawing a blank or lacked inspiration. You may find your disinterested or preoccupied daughter laughing and smiling after she gets moving. It’s sort of like raking leaves for me this fall. I looked outside in the cold dark damp night lacking motivation to fill 15 bags with wet leaves. After 3 hours I finished the last bag, carried it to the garage and found myself raising my arms and fists like Rocky at the top of the courthouse steps. I just had to get moving and build some momentum. She must understand this important point: It will be her softball talents that are being judged and not her personally. Why is her dream to play softball? It should have nothing to do with her brother’s baseball career or anybody else’s athletics or endeavors. It shouldn’t be because she wants to please her mom or aunt who used to play softball, her dad who played college ball or anybody else. It should only be because she loves the game and wants to play (period). From the book this equates to writing for others rather than yourself, or writing what others like and not what you like. A good example of this is several years ago I was given a book about building web sites as a business. The Internet was in its toddler days and web sites were quickly becoming seen as necessities for small businesses. I had already been building web sites for years. I looked at this guy’s work and was dumbfounded. He clearly was an amateur, yet he wrote a book portraying himself as an expert. Clearly he had the ability to write, but he was certainly not writing about anything he was truly passionate about. She must follow through with what she’s started to the end. She must understand this important point: It will be her softball talents that are being judged and not her personally. Regardless of the outcome, she will be able to hold her head high and know that she gave it her all, while never needing to look back later in life with the regret of never even trying. She may find that she’s not the second baseman as she always has been, but the new star center fielder. And she could end up back at second base midway through the season. It happens all the time, because somebody refused to give up when they faced adversity. “Get me on the field and I’ll prove myself,” she might tell herself. That’s a player who leaves it all on the field! Had I not gone to that tryout I would never have known whether I could have made it or not all these years later. I attended a major league baseball tryout after I graduated high school, which my mother and #1 fan urged me to do. There were scouts from 6 different teams on hand. I was very nervous and about half way there I thought about turning around and going home, but I knew my mom would have been disappointed. So, I decided to go for it. There were hundreds of young dreamers there. I made the first several series of cuts, but in the end it was not to be. While we were running through the drills I realized I was truly not talented enough, but my nature had always been to give it my all. So, I did. They thanked me for coming. I went home, not in sorrow, but with closure. I realized it was time for me to hang up the cleats and start working towards my next dream. I explained the experience and my feelings to my mom and she was supportive and became the #1 fan of my future ventures. Had I not gone to that tryout I would never have known whether I could have made it or not all these years later. The experience of that tryout, even though I didn’t make the cut, helped me in my professional career immensely. It helped me with the many job interviews I had, starting a business and selling my products and services, public speaking to groups of hundreds of people, completely changing careers and heading into the unknown fearless and unafraid, etc. “You don’t hire me, fine your competitor will,” I thought to myself a time or two. That’s overcoming resistance. That’s leaving it all on the field. That’s what I taught my daughters.